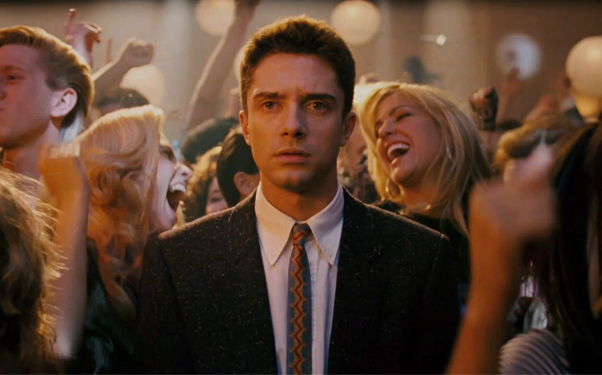 Choice ‘e’ was the case with Take Me Home Tonight, Topher Grace’s ‘80s-set “passion project” that he developed with director Michael Dowse for years before finishing production in 2007. Once the film was completed, it was buried in movie purgatory before recently getting resurrected for a limited release. The studio is marketing the film as “a John Hughes-type movie with cocaine, lots and lots of cocaine.” This isn’t true for a number of reasons. First off, if you’re trying to label your film as controversial for its frank depiction of casual drug use, then you should probably have more, you know, drug use in it. By my count, two characters each do one line of coke in the entire film, off screen. So… what’s all the fuss about? Secondly, Take Me Home Tonight ain’t no John Hughes flick. If it were, then it’d be funny (nope), charming (not a chance), daring (ha), and memorable (no way). In Take Me Home Tonight, he plays a squeaky-voiced fumbler who, despite having recently graduated from MIT, has no ambition to do anything with his life. That is, of course, until he runs into his high school crush who invites him to a bitchin’ Labor Day party. You’ve seen it all before: the geek tries to, and undoubtedly will, get the girl, but not before a few cute shenanigans ensue. There is one small thing about Take Me Home Tonight that I actually enjoyed (well, other than the rockin’ soundtrack), and that would be Teresa Palmer, who plays the interest of Grace’s affection. I’ve never seen Palmer in anything before, but I can tell you that she has some serious comedic timing resting gently on top of some dramatic acting chops just waiting to be tested. I’m looking forward to seeing what she’s got.